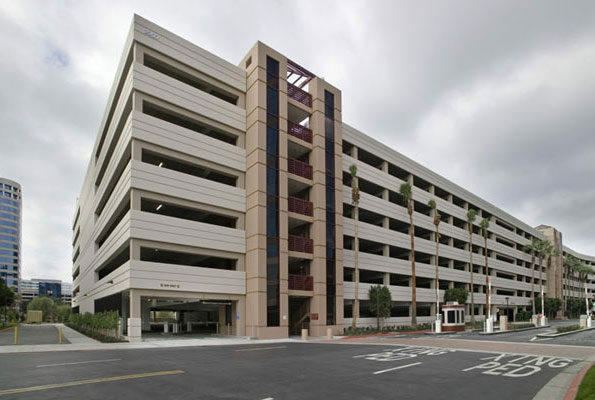 This seven-level, post-tensioned concrete parking structure at the Irvine Center office complex accommodates the new 314,074-square-foot, 13-story, Class A high-rise office building built by Opus West Corporation. The design/build parking structure by Klorman adds 810 parking stalls to the complex and established itself as a premier example of how the unique designs and flow of parking structures can merge with an established business center. During construction a new pile installation method was utilized that avoided the vibration and noise associated with conventional driven pile foundations. The new process contributed to minimizing disturbances of nearby occupied office buildings. The Irvine Center office complex is one of the most dynamic economic centers in Orange County, boasting major companies such as Pricewaterhouse Coopers, Morgan Stanley, New York Life and Miller Brewing Company.